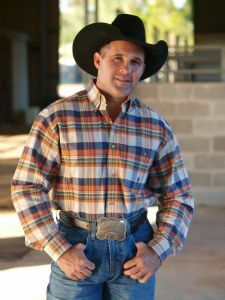 Cade Schalla is a Texas transplant via Montana and New Mexico, former professional rodeo cowboy and veteran of the U.S. Navy. He performed cowboy poetry at the Katy Sunrise Rotary and explained the history of how it came about. Cowboy Poetry started with the great American Trailride of the 1800's.It is often thought of a humorous, but often it runs the gamut, from sad to hair-raising scary. It provided entertainment on the long nights out for the cowboys watching over the cattle herds headed north. It is now woven in to the American folklore of Wild West. Cade grew up in Montana, starting in rodeo from a very young age. He grew to love the values of small town life and you will find that wrapped in his poetry: a slower pace,honesty to others,geniune concern for neighbors, families who take the time to talk to each other, and going to church on Sundays. "Winner of the 2009 Cowboy Poetry contest"